THE number of racist attacks reported in Northern Ireland remains significantly lower than other UK regions - despite authorities fearing a fresh Brexit spike in hate crimes against migrant communities. As we inch closer to a no-deal Brexit in the wake of this week's defeat of the Prime Minister's EU-UK deal, there are concerns it could heighten tensions. Those fears increased in recent weeks following a loyalist attack on the Roma community in greater Belfast and the announcement that 1,000 police officers from England and Scotland could be deployed here if there is any Brexit related street disorder in the coming months. However, an analysis of race hate figures indicates that - unlike other regions in the UK - Northern Ireland has not seen a rise in race hate attacks against ethnic minority communities since the vote to exit the European Union. The Detail has looked at race hate crime statistics in England, Wales and Northern Ireland since the UK voted to leave the European Union. 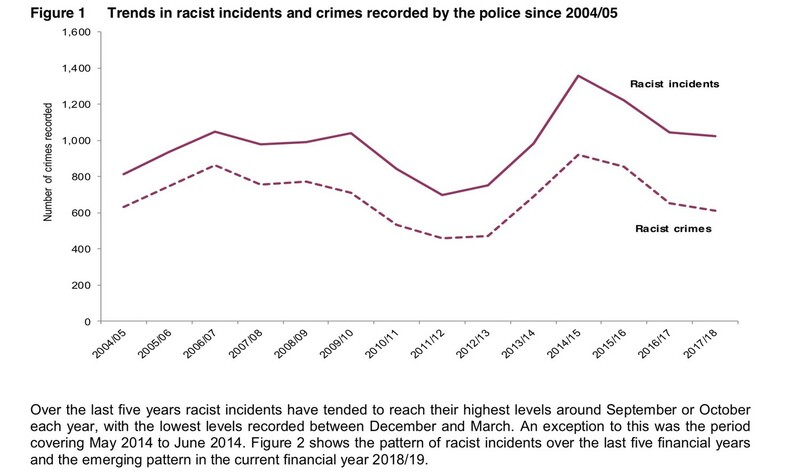 These show that in the three months following the Brexit announcement in June 2016 police forces in England and Wales recorded a significant spike of 14,381 racist crimes. In contrast the number of PSNI recorded racist crimes in Northern Ireland for the same three month period in the summer of 2016 was 251. Clearance levels of race hate crimes in Northern Ireland also remain significantly lower than those of other non-racially motivated crimes. 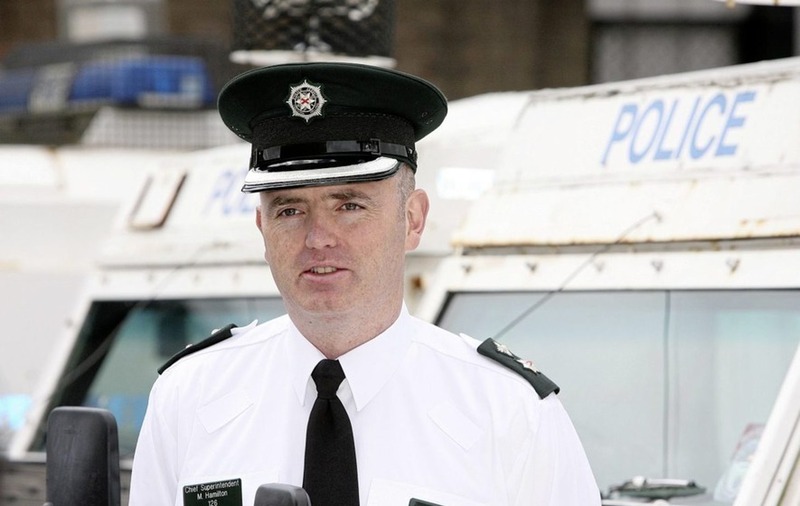 PSNI assistant chief constable (ACC) Mark Hamilton is the UK’s most senior police officer in charge of tackling race hate crime. In an interview with The Detail, he confirmed that police forces across the UK are now preparing for a potential spike in racial attacks ahead of the UK’s exit from the EU on March 29. However, he insists there is no available evidence to suggest that this will happen in Northern Ireland. “The Brexit vote led to a spike in hate crime in England and Wales,” he said. ACC Hamilton is also fearful that some hard-line pro-Brexit elements could resort to violence against ethnic minority communities if the decision to withdraw from the EU is not in-acted on March 29. “If the aspirations of those people on a UK-wide basis were not met, then given the pattern you saw when they got their aspiration, it’s not unreasonable to predict that you could have similar behaviour,” he said. Despite an announcement earlier this month that 1,000 English and Scottish officers are to receive additional training in case they are needed to deal with civil disorder in Northern Ireland, ACC Hamilton does not believe their deployment will be necessary. PSNI statistics show that race hate has overtaken sectarian crime in Northern Ireland in recent years. 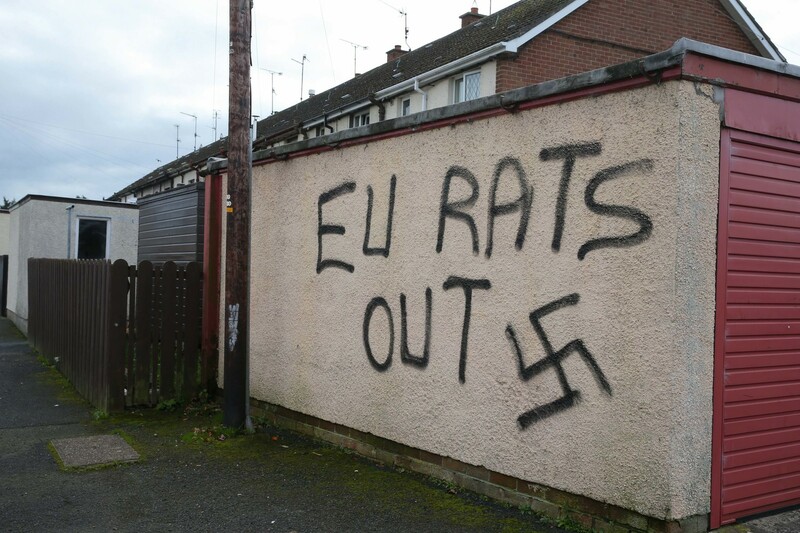 Since the UK vote to leave the EU in June 2016 there have been 2,093 recorded racist incidents in Northern Ireland. In the same period there were 1,773 recorded incidents of sectarianism across the north. There are concerns that the true number of racially motivated attacks in Northern Ireland may be much higher. Veteran human rights campaigner Bernadette McAliskey works closely with migrant families in counties Tyrone and Armagh. “Nobody has reliable statistics on racist attacks because there is no coherent standard reporting mechanism,” she said. However, Mrs McAliskey says the incidents are often recorded as anti-social crime rather than racially motivated attacks. “Why? Nobody lives in the house, so no specific person has been attacked or victimised,” she said. “It is anti-social behaviour! Is it a crime? If it is not a criminal offence in itself, it is not a hate-crime? 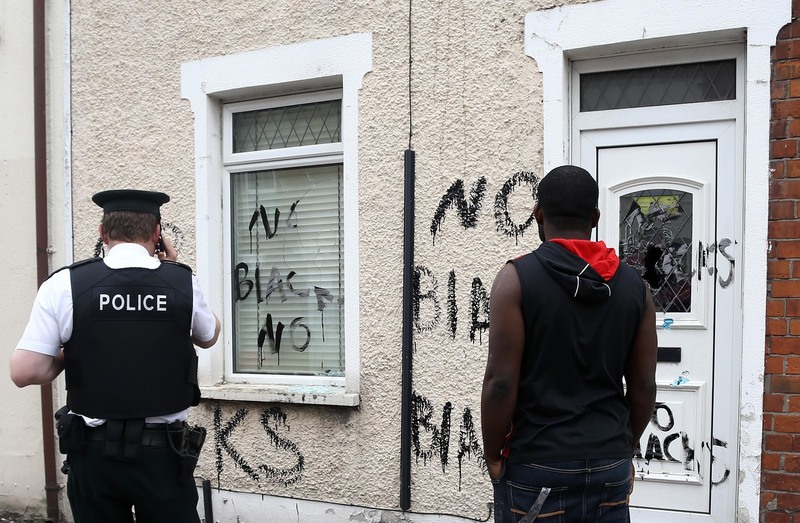 Under-reporting of hate crimes means there could potentially have been up to 10,000 racist incidents in Northern Ireland since the Brexit vote compared to the 2,093 incidents recorded by the PSNI. In England and Wales, the Office for National Statistics (ONS) publishes crime statistics based on a combination of non-police crime survey data and crime figures collated by police themselves. While the Department of Justice in Northern Ireland publishes a similar crime survey, Mark Hamilton says the PSNI has no access to this data and reports only on its own crime figures. “Like any crime figures, they’re based upon a lot of factors; whether or not we record them right, whether or not we ask the right questions; whether or not people actually report them and whether or not they’re actually occurring. While there are specific race hate offences available to police forces in England and Wales there are no similar specific racial offences available to the PSNI in Northern Ireland. The senior police officer believes that race hate legislation in Northern Ireland needs to be brought into line with the rest of the UK. “(If) somebody walks up to a black person in the street in England and assaults them and we believe that to demonstrate hostility because of their colour, that's a specific offence - here it isn’t. He said that statistically women from migrant communities in Northern Ireland are more likely to be victims of racial attack than their male counterparts. The latest hate crime statistics recorded by the PSNI reveal that racially motivated attacks on females have risen from 30% of the total in 2007/08 to 40% in 2016/17. 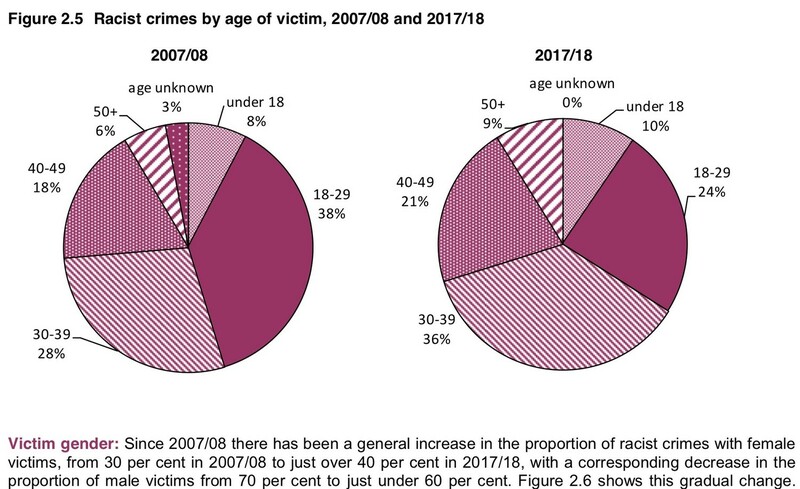 Mark Hamilton also stated that race hate figures show that women from ethnic minority communities are more likely to face racial attack or abuse while using public transport. There is only one senior police officer in the whole of the UK tasked with working on race hate crime on a national basis. The police oversight body, Her Majesty’s Inspectorate of Constabularies (HMIC), recently published a series of recommendations as to how police forces across the UK could improve their handling of race hate crimes. The man tasked with implementing these measures admits it’s unlikely that the majority of these recommendations will be achieved within the recommended six-month time frame. Committee on the Administration of Justice (CAJ) deputy director Daniel Holder believes the way in which the PSNI records hate crime fails to identify paramilitary orchestration in racial attacks. “There has long been an abundance of references, many from the PSNI itself, to involvement of elements of loyalist paramilitarism in racist attacks – yet at a strategic level there seems to be a decision to at best downplay the issue and do little about it,” he said. However, ACC Hamilton said finding actual evidence of paramilitary orchestration of race hate attacks was difficult. “Have I ever seen this notion of organised hate behaviour? No, I have never seen it. “Are there people who are involved in hate crime in the communities who I would associate with paramilitary groups? Yes, I would, absolutely. ACC Hamilton says that while race hate also exists in the nationalist community, the vast majority of incidents occur in the loyalist community, with increasing attempts by far-right groups to find a foothold in Protestant areas. “Most of the major race incidents that we have seen have occurred generally in loyalist areas. “I think there is the link to the paramilitary groups, there will be overlaps of people in those areas who will be involved in paramilitarism and who will be involved in intolerance. He points to efforts by the ‘Britain First’ group to build support in loyalist areas of Ballymena and Newtownabbey. “It doesn’t mean that there isn’t hate crime in nationalist areas – there clearly is. There’s lots of sectarianism and other types of hate just as prevalent. The latest PSNI statistics recorded until December 2018 show that only 12.6% of reported racially motivated crime is solved by the PSNI compared to 26.9% of reported non racially motivated crime. ACC Hamilton admits more can be achieved in how race hate crimes are investigated – including the initial identification of racially motivated crime. “There isn’t a police officer serving in the UK who hasn’t had hate crime training. Despite the challenges of investigating race hate crime, ACC Hamilton remains upbeat that the PSNI continues to improve the quality of outcome for victims including recognition and recording of offences and ultimately investigation. “I think we’re not as good as we want to be and I fully support the push towards improvement.